I have this Weston(?) 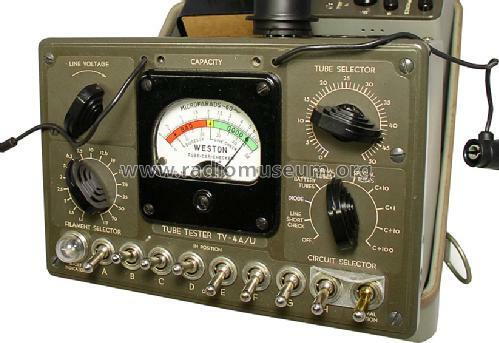 TV-4A/U tube tester which is part of a US Navy - Test-Tool Set - AN/USM-3A and really need a schematic for it. No tube in it. I've found a manual and tube data but no schematic. Any one have a lead on one? Also looking for the headphone and band for it. Everything else seems to be complete except for the tools. All major components are there. One more thing, the case says "Radio Frequency Labs". Is this TV-4 made by them or by Weston? It does have a Weston meter. Maybe just packaged by Radio Frequency Labs? from: Tube Testers and Classic Electronic Test Gear by Alan Douglas. Alan once described this model as being quirky! Technician's handbook AN / USM-3 (no schematic). I've sent you Phil's email address via PM (private message). I have sent Phil an email regarding the schematic and parts too. I have downloaded the same books you linked to but yeah, no schematic. I can't even find out what the number of the tube is that's missing ! As the 3A4 and the other tubes for the signal tracer have been given reference designations V-101 and V-201 V-202 V-203 this may be where the elusive schematic once was? Perhaps he has the schematic? I'm still in search of a full manual for my AN/USM-3A. I have the "section 1" but it is incomplete. Does anybody know where can I find it? A free PDF is obviously preferred, but I'll pay a reasonable fee for it.